The SPI7SEGDISP8.56 module can be interfaced with any microcontroller that has 3 I/O pins available. If the microcontroller features a built-in hardware SPI, then the display module can be interfaced as a SPI slave device. In that case the SPI signal lines SDO (serial data out), SCLK (serial clock), and SS (slave select) from the microcontroller can be directly connected to the DIN, CLK, and LOAD pins of MAX7219. The LOAD signal is active low. This entry was posted on Wednesday, January 9th, 2013 at 7:00 pm	and is filed under Arduino, LEDs. You can follow any responses to this entry through the RSS 2.0 feed. You can skip to the end and leave a response. Pinging is currently not allowed. Maybe like me – He had no idea! Lol. 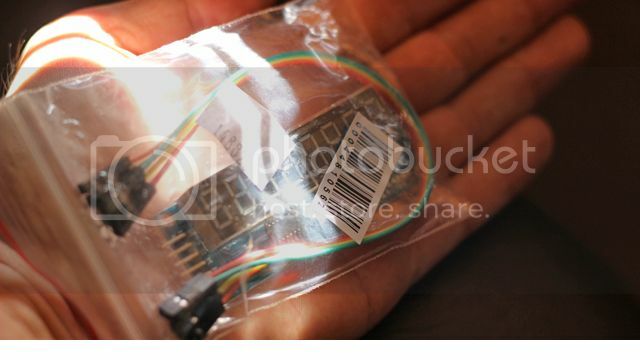 https://www.sparkfun.com/products/11405 as I need one and was thinking of getting the normal SF serial https://www.sparkfun.com/products/11441? and modifying it for the Tall display, but now I might get one of these and mod – Unless of course you know something matching the above? 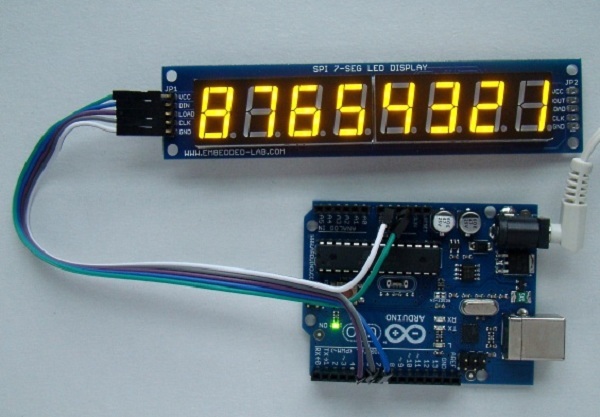 I am working on a basic display circuit, similar to this one. Glad I bumped into this and found out about that display module sold by dx…but it’s been out of stock for so long! I can’t find ANYTHING like that for that price. Sparkfun sells it for 3-4 times the price…I don’t get it. I really don’t want to design from scratch (reinvent the wheel) or spend any more than I need to. That display board from dx was the ticket: it came with onboard chip (controller?) and a total of 8 digits. The PCB had mounting holes and hardware…all for just $4 bucks. Anybody know where I can find this? You could use this one instead http://www.dx.com/p/8x-led-display-digital-tube-module-for-arduino-595-driver-148820 or just look around DX more, they tend to have lots of different pages with the same thing, so if it’s out of stock on one page, probably in-stock in another. Note that the link I posted above is not identical to the unit that Anon showed. Here’s another http://www.dx.com/p/bonatech-8-digit-led-seven-segment-display-module-deep-blue-297686 That was all of 20 seconds worth of looking to find these, so look around yourself and find one that works for you. I’m told that DX are crazy slow on delivery, so keep that in mind. Thanks for the response, my man! Appreciate it. Already had a live chat with DX website and placed my order. lol, no probs. Let us know how long it takes to get to you (and where you’re from), will be interesting to see, as I’m told they can take ages. (yaaawwwnnn….) Just woke up from a long nap of WAITING. Sleepwalker guy was right about the customer service at DX website. I just picked up my delivery today…AFTER A MONTH!